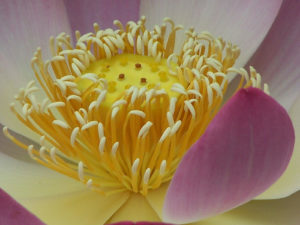 Indian lotus is native to southeast Asia, though it has become naturalized in Australia and other areas of Asia. Although November is probably the nadir for plants in bloom within UBC Botanical Garden, flowers aren’t entirely absent. 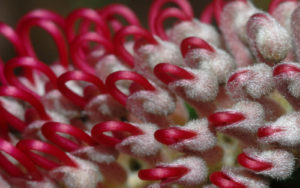 Between the collections in the Winter Garden and the Alpine Garden in particular, there are easily over a hundred different species in flower, including this plant from southeastern Australia, the royal grevillea. Eric La Fountaine (UBC Botanical Garden staff member) visited Australia last year, and snapped this photograph of bird’s nest banksia (also known as woollybear banksia (–or not, see comments–). 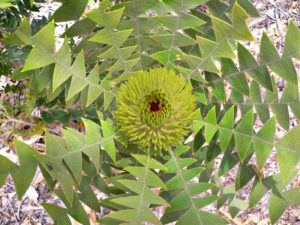 Banksia baxteri grows natively in tall shrublands with sandy soils along the south coast of Western Australia. 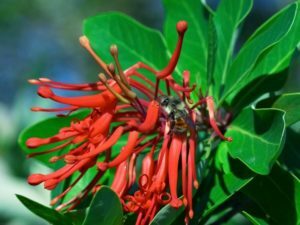 This region is one of the world’s “biodiversity hotspots“. Despite there being roughly eight thousand different taxa of plants at UBC Botanical Garden, only a precious few are remarked upon year after year in the lunchroom. The first magnolia blossom in spring. 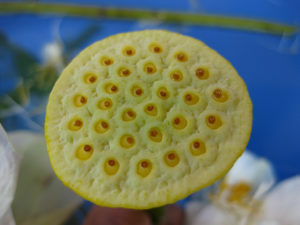 Melliodendron xylocarpum. 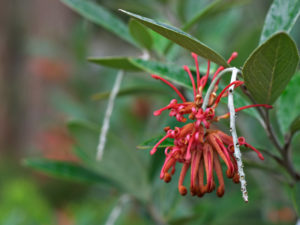 And this, Embothrium coccineum, from the Alpine Garden.